No soggy bread pieces here! 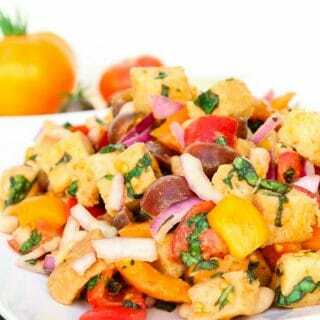 Check out my protein-filled twist on a classic Tuscan Panzanella bread salad! It's filled with fresh ingredients and flavor! Toss the cubed bread pieces with 1-2 teasp olive oil and some salt. Line a baking sheet with parchment paper. Place the tossed bread cubes in a single layer on the lined baking sheet. Bake at 300 degrees for 10-15 minutes until the bread pieces just starts to become crispy (in the meantime, continue on to the rest of the recipe). Remove from the oven and allow to cool completely on the baking sheet. NOTE that you will only use 2 cups of the baked bread pieces in this recipe. in a large mixing bowl, add all the 'Salad' ingredients above. Toss and season with some fine sea salt and freshly ground black pepper to taste. If you are planning on serving this salad at a later time, store all the contents of the mixing bowl in an airtight container in the fridge and allow the flavors to marinate together. Store the completely cooled baked bread pieces in an airtight container at room temperature. Right before you are ready to serve the salad, toss 2 cups of the cooled baked bread pieces with the salad and season to taste with fine sea salt and freshly ground black pepper. I highly recommend using heirloom tomatoes for this salad, but it’ll taste great with any assortment you can get your hands on. Pre-ahead Tip: You can easily prepare this meal ahead of time or take it to a potluck or summer picnic, just be sure to add in the baked bread pieces prior to serving. If you have leftovers and have already mixed in the baked bread, you can store the remainder in the fridge in an air tight container. Although the bread will lose it's texture a little it's still delicious and to be honest I’ve even enjoyed leftovers (with the bread mixed in) the following day.